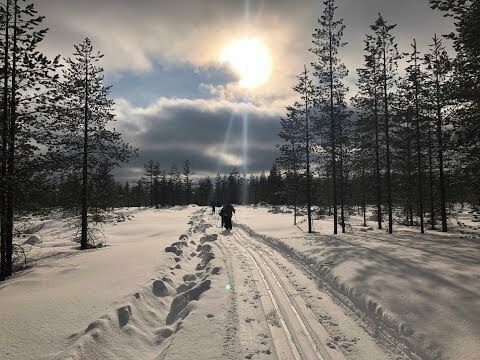 A unique opportunity to develop your skiing in Vuokatti, Finland then put it into practice and ski a point-to-point journey along the frontier between Finland and Russia. Our route follows the Eastern Border winter trail, taking you through pristine wilderness areas. If you have a sense of adventure and would like to experience the joy of skiing through a beautiful winter landscape where few others go, then this is the trip for you. With luck, you may even witness the Northern Lights dancing across the night sky! We have teamed up with excellent Finnish ski guides to take you on an incredible journey through the winter landscape. As well as our local Arctic Wilderness Guide, you will also have the benefit of a BASI qualified Cross Country Ski Instructor from the Tracks and Trails team. A wonderful opportunity to learn about the culture and people of this Russian Finnish frontier area while also improving your ski technique. From December to April the area is deep in snow, offering a long season of winter ski tours. Don't be worried it will be too cold, even if it drops to -25 degrees Celsius the dry continental climate doesn't pose a problem. Throughout our ski trip we stay in comfortable wilderness cabins and guest houses, with saunas available every night except one. The food was amazing with perfect hospitality. Sitting on the veranda in the sunshine mid sauna was glorious. Close second would be the night before in the deserted farm. Our guide…immensely skilled and experienced with a wealth of stories and a fierce sauna technique! Today you begin your journey in Finland with your arrival at Kaajani airport, and then your 45 minutes transfer to Vuokatti. This area is without doubt one of the most famous cross country ski resorts in Finland. This evening your ski instructor, who will be a qualified professional, will discuss your trip and answer any questions you might have about the days ahead. Vuokatti is one of the most versatile all-year-round holiday destinations in Finland offering an almost endless list of trails and activities. The first snow usually arrives in November and lasts through until at least the end of April. The cross-country ski tracks are among the best in the country especially during the first snow of the season attracting many of the world’s top cross country skiers to early season training camps. Many trails start from the main Vuokatti Sports Institute, which sits at the crossroad of around 150 km (94 miles) of ski trails. About 32 km (20 miles) of which are a network of illuminated tracks for evening skiing. It's here at Vuokatti that we take time to re-fresh our ski skills and find our ski legs. We will structure the day in such as way that a natural progression is taken allowing you to pick up new 'tips and skills' to improve your ski technique to ensure your enjoy your three day ski journey along the Finnish-Russian frontier. After a hearty breakfast we will once again take to the tracks and enjoy the best that Vuokatti has to offer. They say that 'Champions are made in Vuokatti' and we will be doing our best to help you at least a small way along that road! But don't worry we firmly believe that skiing is all about having fun and we aim to make sure you have a great time learning to the art of 'nordic' skiing. It is worth noting though that such is the quality of the cross country skiing in Vuokatti that Finland's largest long distance cross country ski race is held here each March. Today we will continue to explore the vast network of cross country ski trails, developing your confidence and furthering your ski skills with your own highly qualified Tracks and Trails ski instructor. We enjoy our last ski in Vuokatti this morning when we will consolidate the skills that you have picked up over the last few days. Then in the afternoon we have a private transfer of 2h30 to Jatkonsalmi cabin located in the heart of the new Hossa national park where we meet our Finnish wilderness guide. The Hossa National Park was established in 2017 as the 40th national park in Finland with the aim of marking 100 years of independence. The village is a popular outdoor tourist destination and is known for the oldest rock paintings in Northern Finland, dating back to 1500-2500 BC. The name "Hossa" originates from the old Sami word Huossa meaning "a place far away". Tonight we stay in a traditional log cabin in Jatkonsalmi on the shore of Lake Jatkonjärvi complete with a sauna. After breakfast, we begin our ski journey to the former frontier guard station at Rajakartano. Each day we will help you to improve your technique while travelling through the forests, providing a great mix of culture and instruction. The forests are very atmospheric with lichen hanging from the trees as 'old mans beard', which is always a sign of the purity of the air. The reindeer feed on it when there is too much snow and they have nothing else. The local Finnish people will sometimes use it to make tea, and it is known as ‘poor mans spaghetti'. We will aim to do 9km (5.6 miles) in the morning, and then take lunch at the Hossa Visitor Centre, where we can also see the exhibition featuring Finland's newest National Park. In the afternoon we continue our journey across the lake as we make our way towards the Russian frontier. Late afternoon you can relax in a traditional Finnish sauna, and the more adventurous among us can even try ice swimming, though it's more a case of an 'ice dip'! At night we will visit a local reindeer farm, where we will enjoy a traditional dinner and of course, learn about reindeer herding. Our accommodation tonight will be at Rajakartano, a wooden cabin by the edge of a lake. Showers and sauna are available. We have our longest skiing day today, beginning on the tracks of Hossa before following the border guard’s trail southward. We cross many small marshlands, and ski through ancient forests. Although we have 25 km (15.6 miles) to ski today the terrain is easy and with much of it flat you will find you can enjoy the kilometres and the experience of arriving on the frontier with Russia! Every few metres there will be a pole with a yellow band around the top. This is the entrance to 'No Man's Land', and you will be warned not to stray into this area! Our accommodation tonight is a lovely experience as it is in a rustic old wooden house on the top of the Kovavaara hill. The house is very simple, and accommodation will be between the main building and two smaller log cabins. There is a wood-fired sauna to relax the muscles after your ski day, but no shower. However, you can do things the local way and douse yourself in warm water from the wooden bucket to clean off! Even if the temperatures are cold, the house and the two smaller cabins, have wood burning stoves which makes it very cosy. Even if Kovavaara doesn’t have modern comforts, in fact it's like stepping back in time to a 1950's living museum. Our guests usually say it is one of the highlights of the tour. This morning we continue our journey along the Russian border zone. We will follow the yellow border zone markers, and these will be our guides for the entire day. On several occassions today we have a view into Russia. In the afternoon we will arrive at Arola situated just a stones throw from the Russian border. Arola is famous for delicious food made by our hostess Helena from local ingredients. The farmhouse, which was built in 1936, also has an interesting history. At that time the owner, Lempi, towed her children on a sledge for over 10 km (6.3 miles) to escape from Russian soldiers invading Finland. She was able to warm the local villagers of the danger and the villages were evacuated. All this and more to be learned over a cosy dinner in a traditional log house served by our hostess. Helena revels in telling tales of the past and the relationship between the local Finnish people and their Russian neighbours. Be prepared to be entertained over a delicious home cooked meal! Showers and sauna available. Today is your departure day. We have breakfast and then we have our private transfer to the airport at Kajaani. Please contact us to confirm arrangements before you book any flights. We always aim to accommodate our guests in well-situated, characterful, family run accommodation. Our suggested accommodation is subject to availability at the time of booking. We have given details below of our favoured accommodation for this trip and the ones we intend to use. If unavailable we will book alternative accommodation of similar standard. Our trip fees are based on two people sharing a room. If you are travelling on your own your booking will be based on a twin bedroom sharing with someone of the same gender. Single rooms may be available on the first 3 nights when we stay in a hotel at Vuokatti, but, if requested, these will incur a supplementary fee. We recommend booking as early as possible to secure a single room as these are always limited in number. Please contact us for details. On this trip we stay in a hotel for three nights and then we begin our hut to hut ski tour when we stay in comfortable wilderness log cabins and a guest house. All the accommodation except Kovavaara has electricity, and there is a sauna at all of the cabins to ease those muscles! The accommodation is mostly in twin rooms, but on rare occasions triple/quadruple/mixed gender rooms may be used. In reality we find that with a group of 10 guests there is enough room in the large wooden cabins for people to spread out and it in not unusual for couples to have a room to themselves. For the first three nights of this trip we are in a very comfortable hotel at Vuokatti. The rooms are spacious, and decorated with natural colour tones taken from the surrounding nature. There is an entire sauna 'department' on the top floor of the hotel offering panoramic views to the hills. The hotel has all the major facilities you would expect to find in a resort hotel and is just 45 minutes from Kajaani airport. The airport bus does in fact stop right at the hotel door. There are two restaurants in the hotel, one which serves traditional Finnish food featuring reindeer on the menu, and another that is more casual dining. They cater well for all diets. The bedrooms all have wifi, a kettle for tea making and they have hairdryers. There is a gym and stretching room at the hotel, and a large sports centre with 3 swimming pools just a 5 minute walk. The ski tracks leave from the hotel door, and it is a short walk to the ski hire shop, beginners arena and a large sports shop. There are male and female saunas on each floor of the hotel. On the third day of the trip when we have an afternoon departure for Hossa and out point to point tour, you will be able to leave your luggage with the hotel and take a shower in the gym before we depart. The hotel is certainly a contrast to the accommodation on the hut-to-hut segment of your holiday where you will be able to revel in the silence and remoteness of the traditional cabins you will be staying in. Jatkonsalmi will be your first trip experience of a traditional Finnish log cabin. It is in a lovely setting in the Hossa National Park, on the shores of Lake Jatkonjärvi. The cabin is spacious with a total of 8 bedrooms, with 28 beds. There are shared toilets and showers, but given that our group is not likely to be more than 10 this means there is plenty of room for everyone. There is a large lounge area and a log fire to keep us cosy. There is also a sauna nearby which is shared with Teräväpää cabin. Meals are served by our guides, and will be simple, but plentiful. The wooden cabin at Rajakartano is a former frontier guard station. Again it is in a lovely setting in the forest by the lakeside. It has a kitchen, living room, 3 toilets and a shower. There is a separate sauna building by the lake, where you can go to dip in the ice cold lake! Showers are also available at the sauna. The accommodation is spread across 5 bedrooms, of which 3 are twin rooms, and 2 are quads. Dinner will a traditional Finnish meal taken at the local reindeer farm which is about 15 minutes walk from the cabin. The herder who is called Kimmo will no doubt introduce you to his 30 reindeer. For many the night at Kovavaara is one of the highlights of the trip. A simple wooden cabin in a remote location in the woods, and certainly a delight to find it at the end of your longest ski day. There is even a wood fired traditional sauna where you can wash yourself down with steaming hot water! Dinner is prepared by your guides, and taken by candlelight! The main building at Kovavaara has three different rooms with several beds in each, but there are also two smaller log cabins available, so there is enough space for everyone and a cosy athmosphere. The sauna is in the separate building, and there are no showers. This is the only accommodation with an outhouse. There is no central heating, but the house is heated with several wood fired stoves, and in case it is very cold we have warm sleeping bags. Arola is simply a lovely place to stay, made all the more special by the hospitality of Helen who is definitely a 'character'. The accommodation is in traditional Finnish style with a lot of 'wood'. Guests are usually accommodated in a range of cabins near the main building. As always there is a sauna available, after all it is part of Finnish life! In total Arola has a number of bedrooms accommodating up to 14 people. These are mostly twin rooms, with shared toilet and showers. Arolla is well-known for delicious food mostly from local ingredients. Dinner is served in the main building in a traditional log-house, Helena will no doubt take the chance at dinner to tell you many tales of her life as a Finn - she's great! You may also meet her husband Eero, their son Jeru (who may be your skidoo driver of the trip) and his wife Jonna. A real family concern. The meeting point and departure point for this trip is Kajaani airport in Finland. The transfer from Kajaani to Vuokatti takes 45 minutes and is included in your trip price. The transfer time on arrival is set to meet the flights arriving in Kajaani at either 1310 hrs or 1715hrs. If for any reason you miss the transfer to Vuokatti you will be able to take a taxi from the airport which will cost approximately 35 Euros. To benefit from this reduced taxi fare you must book the taxi 6 hrs in advance of arrival. If for any reason you do not make your connecting flight in Helsinki we advise you to ring the taxi immediately. By booking in advance you secure a fare of 35 Euros to Vuokatti, otherwise it will be 95 Euros. To book the taxi number is +358 40 660 8000 and the website is Ktaoy Airport Taxi. Please be aware that Finnair often sells flights from London with just a 40 minute change time in Helsinki. In our experience this is too short a time to get through passport control to make the next flight. If the flight times are not convenient for you then we suggest you arrive a day earlier and take time to explore Helsinki before taking the internal flight to Kajaani. At the end of your trip you will be transferred from Arola back to Kajanni airport. This transfer is included in your trip fee. We will depart from Arola at 0930hrs and arrive at the airport at 1200hrs in time to check-in for the flight departing for Helsinki at 1330hrs. Kajanni is a very small airport and arriving 1h30 ahead of a departure is normal. There is also a second flight departing at 1735hrs if you choose to take this then we can still take you to the airport on the morning transfer but you might like to have time in Kajanni centre before the flight. We ski in Finland at the time of year when the snow is at it's best, which is from mid-February onwards. The snow season in the inland regions of southern and central Finland, see the first snow falls at the beginning of December and it usually melts during late March and April. The temperatures in February are usually around -3°Celsius (26.6°F) during the daytime, and dropping to approximately -10°Celsius (14°F) during the night. In Finland the use of the ski tracks is free so there is no ski pass required. In Vuokatti the ski rental is skin-grip technology with NNN bindings. If you prefer to bring your own shoes and rent just skis and poles that is possible but the price is the same. Please make sure that your boots are compatible with NNN bindings. Ski rental can be paid for by credit card. To ensure we get the correct sizes, equipment hire is arranged in advance. Please make note of your equipment hire on our Booking Form. We will need to know your height, weight, normal shoe size (you must give us your everyday shoe size and not your personal adjustment for wearing boots) and the measurement of your height up to your armpits (for ski pole hire). The skis we use are “normal” cross-country skis for classical style, and the width is usually 44 mm. When booking a holiday as a solo traveller a twin bedded room comprising of two single beds, is booked as standard. This will be with someone of the same gender unless you request to pay extra for your own room. Single rooms are often limited in supply so if you would like to pay a supplement for a single room we urge you to get in touch as soon as possible. On this trip single rooms are available on the first three nights at Vuokatti. In which case the single supplement is £240. However, it is possible that on the other nights in the forest cabins you may have a single room by default due to the amount of rooms available. For the first three skiing days at Vuokatti your lunch is not included. You will be able to either order a packed lunch, or we may plan to stop at a cafe by the tracks. Your instructor will advise you of the options. For the three days when we are journeying along the Finnish Russian frontier your lunch will be included. This will be a picnic often taken in the outdoors. Usually you will be served soup and a sandwich. A glimpse of winter in Vuokatti and the many activities and trails that it offers. Vuokatti is the venue for many cross country ski races and each March around 2,000 participants come to the region to ski the Euroloppet Race.